In this era of Twitter and text-messaging, which calls into question previously accepted notions of literacy, today's students need a new and more pragmatic approach to developing writing and research skills. 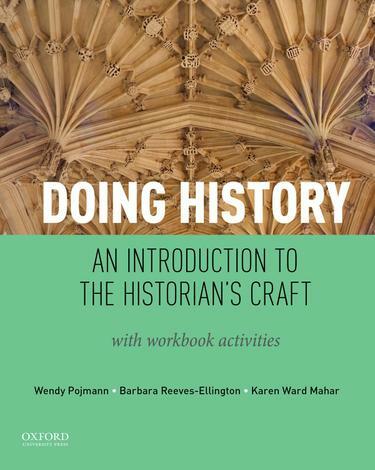 While a number of guides to historical research and writing and several historical methodology texts have appeared in the past several years, no single text accomplishes what Doing History: An Introduction to the Historian's Craft does. Through a unique two-part organization, authors Wendy Pojmann, Barbara Reeves-Ellington, and Karen Ward Mahar offer specific assignments to identify students' weaknesses and build their skills. They provide concrete examples of historical approaches and theories and detailed guidelines to help students complete their work within the constraints of the academic term. The text integrates the complexities of historical research and writing into a single, comprehensive narrative without compromising depth and breadth. Its lively and accessible writing style helps students grapple with sophisticated ideas while also avoiding the pitfalls that commonly entrap them as they learn to think and write as historians. The book's intellectually engaging discussions of the discipline of history in Part One: the Historian's Craft are enriched by solid examples of published scholarship. Students preparing research projects will benefit from straightforward guidelines for the research and writing process. In addition, the integrated workbook in Part Two: Doing History Workbook Exercises allows them to hone their skills with assessment exercises and skill-building assignments.